The Ajanta and Ellora caves in Indian state of Maharashtra are architectural structures cut from solid rock. Both have been given status as World Heritage Sites and are famous for their paintings, sculptures and frescoes. One can explore these caves and experience Hindu, Buddhist and Jain rock cut monasteries and temples depicting religious harmony in ancient times. The Ajanta caves are located in the district of Aurangabad in Maharashtra just outside of a village named Ajintha. Ellora is situated thirty kilometres from Aurangabad. These were actually excavated from the vertical face of the Charanandri Hills. There are two groups of caves in Ajanta. The first was built in about the 2nd century BC during the time of the Satavahana dynasty. The second group of caves was built in 600 AD. 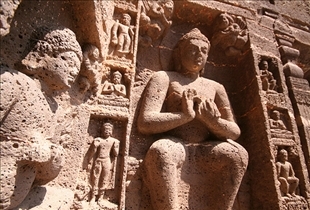 The Ellora caves were built in the period between the 5th and 10th century. The Ajanta caves are comprised of 31 rock cut monuments. Cave one has scenes carved from the life of Buddha. It has a hall with walls of dimension 12 m into 6.1 m. A shrine carved on the rear wall houses an image of the Buddha with his hands in a Mudra position called dharmachakrapravartna. Most of the scenes depicted are devotional and ornamental. Cave two is better than the first one as far as preservation is concerned. It is famous for paintings on pillars, walls and ceilings. Carvings on the face of the cave seem to be different but the size and the ground plan are almost the same as in the case of first cave. Porch, hall and the paintings are the main attractions. Many decorative themes have been used such as animal, vegetative, human, ornamental and the semi-divine. It is a documented fact that the paint brushes used in those times were made up of twigs and animal hair, by hand. Caves one to twelve in Ellora are Buddhist caves. Cave 6 is the earliest followed by 5, 2, 3, 4, 7, 8, 10, 9, 11 and 12. These caves have carvings of the Buddha, bodhisattvas, and saints. Cave ten or the Vishwakarma cave is the most popular among these. It houses a fifteen foot statue of Buddha in a preaching pose. Caves 1-9 are monasteries. Hindu caves were constructed during Kalachuri and Rashtrakuta periods. Seventeen to twenty nine are the Hindu caves. Some famous caves have names like: Cave 16 – Kailashnatha, 15 – Dashavatara, 21 – Rameshwara, 29 – Dhumarlena and so on. Ajanta caves are located outside the village named Ajintha. These are comprised of thirty one rock cut monuments. Cave one has scenes carved from the life of Buddha. Cave two is famous for its paintings on pillars, walls and ceilings. Ellora is situated thirty kilometers from Aurangabad. Ellora Caves were built between the period of 5th and 10th centuries. These comprise of Hindu, Buddhist and Jain rock cut monasteries and temples demonstrating the religious harmony in ancient times. 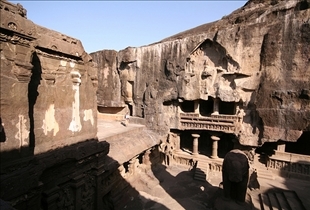 Hindu caves were constructed during Kalachuri and Rashtrakuta periods. Caves one to twelve in Ellora are Buddhist Caves. These caves are located close to the city of Aurangabad in the state of Maharashtra, India. The famous Ajanta and Ellora caves are in fact shrines that have been carved out of rocks. All of this carving has been done by hand and these caves are said to rank amongst some of the most outstanding specimens of the heritage that fall under the umbrella term of ‘ancient Indian architectural heritage’. There are about 34 caves at Ellora and a good 29 caves at Ajanta. These caves had almost been lost in obscurity, until a British Army Officer called John Smith, accidentally tumbled upon them while he was on a hunting expedition. This accidental discovery was made in the year 1819. These caves have been designated as being World Heritage Sites so that the generations to come can also garner inspiration from them.